Sure, there are plenty of new features with iOS 5, but at what cost? Sometimes, the cost for software updates comes in the form of degraded performance of day-to-day core features that you may depend upon. Let’s see if that’s the case with iOS 5. Once again, I used GeekBench 2 ($0.99), Gauge Mathematical Tool (free), BenchTest ($0.99), SunSpider (free) and V8 (free) to test the performance of each OS version on each device. I tested the original iPad 1 Wi-Fi, the iPhone 4 (GSM), the iPod touch 4th Gen, and the iPad 2 Wi-Fi+3G (GSM). If you use the web more than anything else on your iOS device, then you should be eager to apply each and every update that Apple puts out, since they all improve Safari’s performance every time. iOS 5 is no exception in that regard. 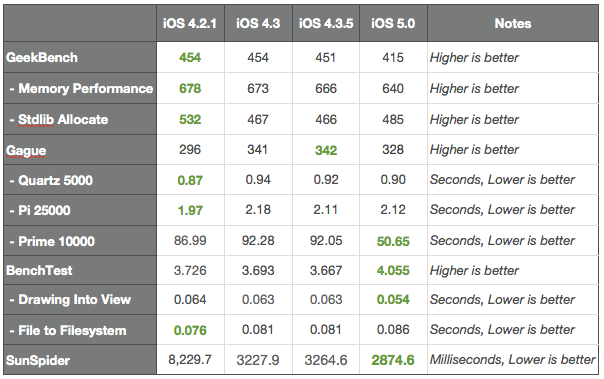 Considering all of the new features you get with iOS 5.0, the hit on performance in other areas is in most cases negligible. In fact, with the exception of the original iPad (the older device that was tested), all devices actually gained in performance in most areas. That is simply amazing for the first release of a major OS update. 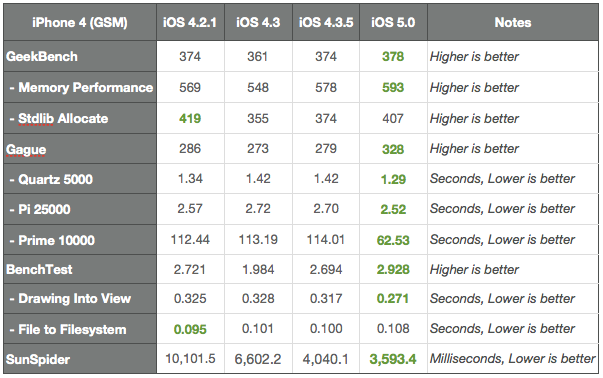 This is nothing like the 4.0 release, where we saw incremental performance gains over the lifetime of 4.0 to restore what was lost to older device; iOS 5.0 is a solid release for all where performance is concerned. Could you also check how much memory is free on the different iOS versions? I’m having quite often problems with low memory on the iPad 1 so especially games keep crashing, forcing me to close all other apps int he background and retry. Unfortunately I cannot go back and see how each device managed memory under typical daily usage, as I cannot go back to prior versions of iOS. It is important to keep in mind that developers may not have the same mix of Apps installed that is creating a memory challenge on your iPad 1. Some developers may not have the opportunity to test their Apps on each of the possible devices du to limited time and resources. I would suggest informing the developer directly of the situation you are facing, and see if they have a fix already in the works. I upgraded last night east coast at about 7:30. I had no problems and all my apps except 1 (Alarm Clock) transferred. I have been noticing one problem today, my E-Mail loads very slow and then to return from reading an E-Mail to the E-Mail list almost seems to freeze for about 10 seconds. Everything else is fine. Regarding the 3GS, I have not had access to a 3GS over the last year I have been collecting such data. I have data points for every iOS release on the devices I do have. Give your 3GS to the homeless and buy a new iPhone. The First table (iPad 1 WiFi) is full of errors! 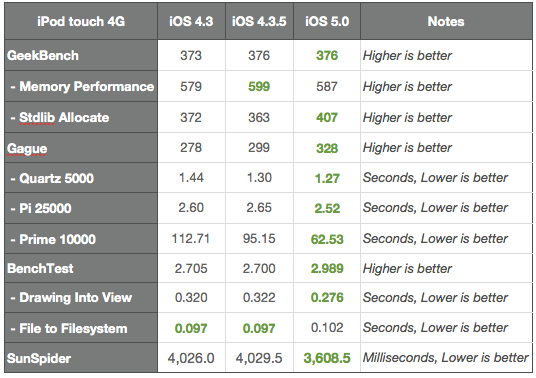 How come in the BenchTest test the best score was in iOS 4.2.1 if in the iOS 5.0 the score was 4.055? And in the Drawing into View iOS 4.3, 4.3.5 and iOS 5 are marked as best ones? And how many times the tests were conduced? There should be an error margin in tests like these! The results shared are snapshot point in time measurements. Apologies on the highlighting. The iPad 1 was actually the only device I tested that deviated from the others. OK. I understood now. Glad I helped. But it’s really interesting that iPad 1 didn’t follow iPhone 4 results. I think memory really makes difference here. Thanks for noting. Highlighting issue corrected. Yes, please can you test the 3GS, as it would be very useful to see the change in speed. As i can remember the change from iOS 3 to 4 dramatically decreased the productivity in 3G, so was wondering if it will do the same to 3GS. i absolutely agree with the other commenters. considered the way iOS 4 practically bricked the old 3G rendering it almost useless some information on benchmarks on a 3GS would be very useful. Why didn’t you test it on the 3GS? That’s the one device where I would expect to see a noticeable performance hit. Agreed. Please test the 3GS!